Before the Chickasaw Wellness Complex was officially open, a contest was held to design a symbolic logo for the facility. The contest was open to all residents living within Chickasaw County in which nearly 50 entries were submitted. The winner of the logo contest was awarded to Sami Stone, a member of the New Hampton community. 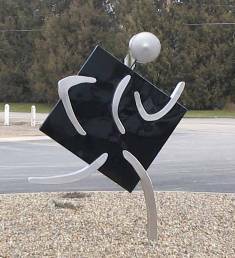 A steel sculpture of the logo is located in the front of the complex and was fabricated by steel-enthusiast, Joe Gebel. Gebel fabricated the statue in his garage at home in less than 80 hours after working his regular job at New Hampton Metal Fab.